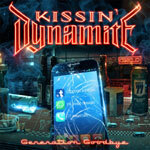 Even if Generation Goodbye is Kissin' Dynamite's 5th record, I personally have only heard just a few songs by the band before and honestly I can't specifically remember much of what was given on those occasions, so I would say that these fairly young Germans' music is more or less a new experience to me at this point. Most stuff on this new record is quite easily embraced because of its pretty easy-going appearance with frequently attractive choruses and kind of a light attitude overall and the lyrics very much deal with today's society of quick information and with constantly being up-to-date with your own and everybody else's life through different kinds of channels and social medias. Some of the songs definitely have a really nice swing and drive and are in fact very engaging, but the record is nevertheless somewhat uneven quality-wise, as a few songs just come out without any real effect and don't have the necessary equipment to convert into something appealing and thereby can't be considered as nothing but filling material. Generation Goodbye is a fairly good and pretty diverse album though, on which I fancy the faster and heavier songs a little bit more than the mid-tempo and the softer stuff. If you don't mind carefree hard rock and light metal music, this one is certainly worth a couple of spins in order to find out if it's something that would fit with your very own personal taste of music.